Black pepper, is widely believed to be the most common culinary spice in the world.Black pepper helps relieve cough and colds .Pepper's antibacterial properties also make it an effective remedy for respiratory conditions including colds, coughs and flu. Pepper's spiciness clears congestion and helps clear up sinusitis.Black pepper (Kali Mirch )aids digestion .Pepper's natural antibiotic properties make it an effective remedy for intestinal diseases caused by bacteria. Pepper causes an increase in the secretion of hydrochloric acid in the stomach, improving overall digestion by reducing gas, diarrhea, constipation and colic.Black pepper helps in weight loss .The outer layer of the peppercorn contains substances that boost fat metabolism. Adding black pepper to foods may help in the treatment of obesity.Garlic also helps in reducing cold and cough. Dry roast the black pepper corns, in a pan for a few minutes on medium heat tossing them around till the flavors come out and you find a nice aroma emanates the kitchen.Turn off the heat and make a coarse powder. Heat ghee in a pan and add cumin seeds and let them splutter.Then add thinly sliced garlic.Saute till garlic become golden.Then add grounded black pepper powder.Saute for a minute and then add the cooked rice and salt combine it with the tempering such that the spices coat the rice well.The full flavor of the pepper is obtained on freshly ground pepper corns which enhances the taste of the rice giving it a sharper, more flavorful than the pre-ground pepper powder . Serve hot. You can also serve with any gravy curry or plain rasam ,papad. 1) Use freshly grounded Black Pepper Powder. 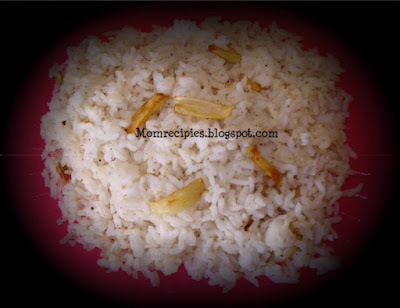 2) When you are ill if you eat this flavorful rice it gives a very excellent taste to your mouth and remove indigestion.